Our special blend of Melaleuca oil, Omega-3, and Argan oil (M.O.A.) will replenish, protect, and nourish while restoring shine,softness and youth back to your hair. 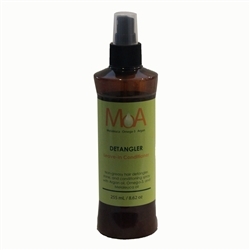 Non-greasy leave-in conditioner, Detangler will leave hair feeling soft and shiny while MOA nourishes and restore last protein and oils. Use on wet or dry hair superior detangling on wet or dry weaves or extensions,helping to prevent dullness.